I first heard about Author John U. Bacon as a graduate student at the University of Michigan where I regularly listened to ‘The Ticket 1050 AM-WTKA‘. I heard all of the latest news and commentary on Michigan sports on that station, and it was a lot of fun listening to it all, especially during football season. I later found that John was a fixture at the University serving as a faculty member, and as an Ann Arbor native he had a deep knowledge of the history of the University of Michigan’s athletics – particularly its storied football program. John U. Bacon has authored numerous books about the program, its coaches and players, and the world of big time college football in general. 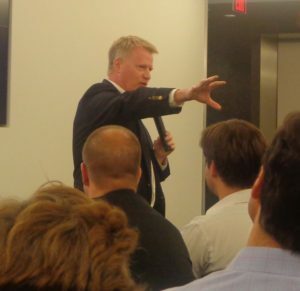 In 2015, the University of Michigan Alumni Club of Greater Washington D.C. hosted John who presented his latest book Endzone: The Rise, Fall, and Return of Michigan Football. The book chronicled the ascension of the football program, its descent into perhaps its darkest time, and then its magical return solidified by the hiring of Head Coach Jim Harbaugh. I originally published this piece on the Examiner in November of 2015. We were deep into Jim Harbaugh’s first season – weeks after the heartbreaking loss to the Michigan State Spartans at the Michigan Stadium best known to alumni (such as myself) and fans as the “Big House”. With the exception of a graduate transfer from Iowa named Jake Rudock, Coach Harbaugh inherited Brady Hoke’s players and had begun implementing his own culture. Three years into the rebuilding of the program, we haven’t made it into the College Football Playoff (CFP) yet, but the maize and blue is much better off than in the years spanning from 2007 to 2015 – the eight-year stretch that John U. Bacon chronicled in Endzone: The Rise, Fall, and Return of Michigan Football. 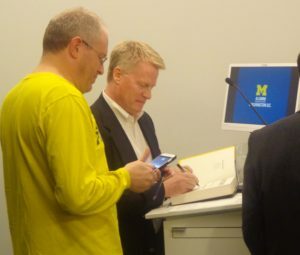 On October 29, 2015, the University of Michigan Alumni Club of Greater Washington, D.C. hosted a book signing by Mr. Bacon. The event took place at Squire Patton and Boggs, and started with registration, followed by an initial book signing. He then gave a detailed discussion of the genesis of his latest book, followed by an overview of its story. “If you’re running Michigan athletics, yes, you have to have sound business practices. However, you also need to understand that the reason the thing exists is that the people see it as a religion and not a business, and that’s a fundamental difference between the Redskins and the Wolverines,” Bacon said, discussing the magic behind Michigan Football. Endzone chronicles the ascension of the University of Michigan’s football program spanning from its earliest days unde9r Fielding Yost to its recent golden age under Bo Schembechler and Lloyd Carr. He then discussed how the magic of the program was lost in recent years, due to poor administrative, business and political decisions made off the field that, negatively affected the product on the field and support of the program. The book also discusses the current re-ascension of the program with the recent hiring of Jim Harbaugh, one of the program’s legendary quarterbacks and most celebrated figures. • Bo’s Lasting Lessons: The Legendary Coach Teaches the Timeless Fundamentals of Leadership. 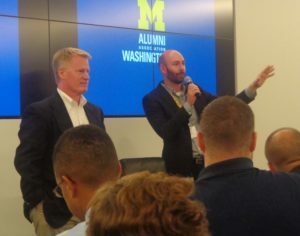 “Endzone is not only a chronology of Michigan Football, it’s also a story of how not to run a business,” said Erik Ruselowski, Treasurer of the DC Alumni Club during the introduction. Following the discussion, Mr. Bacon finished signing books for the 100-plus attendees who purchased all of the available copies of Endzone that evening. I was a graduate student at the University of Michigan towards the end of Lloyd Carr’s tenure as Head Coach of its football team. My first year was actually Tom Brady’s senior season and the inaugural year of the controversial Bowl Championship Series (BCS) – the predecessor to the CFP. Coach Carr’s teams were talented and competitive but in the new era of the BCS, he was unable to recapture the magic that carried the Wolverines to the National Championship in 1997. During that stretch there were always two to three losses that took Michigan out of contention. Our fan base began calling for his head and ultimately they got the coaching change they wanted. They also got several things they didn’t want or anticipate. As Mr. Bacon describes in Endzone, there is a lot more that goes into a college football program than what you see on the field on Saturdays, in the bowl games, and at the NFL Drafts. 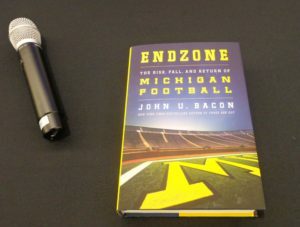 Since publishing Endzone, Mr. Bacon has published two more books: Playing Hurt which he co-wrote with ESPN’s John Saunders, and The Great Halifax Explosion in which the story’s main hero is the University of Michigan’s first hockey coach. 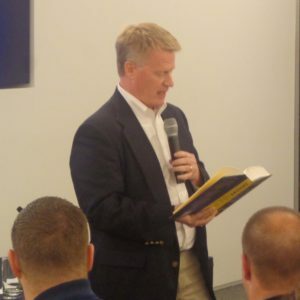 To learn more about John U. Bacon his books, and speaking engagements, go to: www.johnubacon.com. 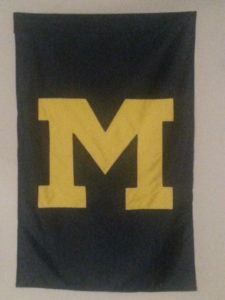 The University of Michigan Alumni Club of Greater Washington, D.C. hosts many events throughout the year for its alumni, in addition to its sports game watches, for which the University and its alumni are well known. 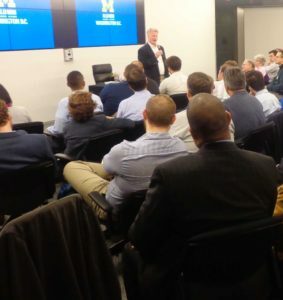 If you are a University of Michigan alumnus in the Washington, D.C. metro area and would like to keep up with the club’s events, please go to www.umdc.org. GO BLUE!!!! Thank you for taking the time to read this post. If you’ve found value here and think it would benefit others, please share it and or leave a comment. To receive all of the most up to date content from the Big Words Blog Site, subscribe using the subscription box in the right hand column in this post and throughout the site. 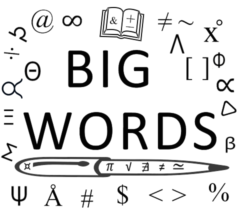 Lastly, follow me on Twitter at @BWArePowerful, and on the Big Words Blog Site Facebook page. While my main areas of focus are Education, STEM and Financial Literacy, there are other blogs/sites I endorse which can be found on that particular page of my site.